Slate roofing has been popular in Europe and for large structures in the United States. This type of roofing material has always been admired for its looks and durability. It is said that it lasts over one hundred years. However, like any roofing material, it has its drawbacks. Slate is extremely heavy. That presents two problems. It takes at least two men to lift the slate shingle in place. 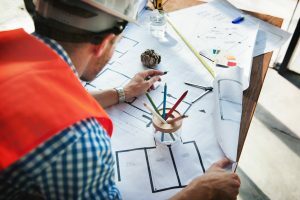 Besides that, the sheer weight of the shingle may call for the roof structure to be made heavier to handle the added weight. Other negatives of slate roofing is that it is fragile to cut and nail and also it cracks easily. Synthetic slate roofing are a big improvement over traditional slate. Synthetic slate roofing mirrors the look the of slate roofing. However, it is manufactured with very different materials.This new kind of slate is made with a combination of plastic and rubber. This eliminates the expense and installation problems of original slate. Synthetic also lasts longer than traditional slate. Synthetic slate is created using an injection molding process, where petroleum based products are injected into a metal cast made from actual slate. The product is constructed in two ways. Sometimes new rubber and plastic are utilized to form the synthetic slate. In other cases, recycled rubber and plastic are used. Synthetic slate roofing is considered a “green” building material . At the end of its life, synthetic slate roofing can be recycled. That means compared to asphalt synthetic slate roofing won’t be thrown in to a landfill. This ability of synthetic slate roofing is better for the environment. When we talk “cool roofing, it speaks to the ability of a roof to deflect the sun rays. Synthetic slate roofing has advanced ultraviolet inhibitors that keeps harmful sun rays away from your house. The advanced ultraviolet also reduces wear on your home. Safety is an outstanding feature of synthetic slate roofing. This type of roofing contains impact modifiers that diminish the effect of storm damage. In fact, it has the highest rating in the category of lessing the storm damage. Likewise, synthetic slate roofing is highly resistant to fire. It also has the highest rating for repelling the damage that fire can cause to a roof. A number of things that are negatives for traditional slate are positives for synthetic slate roofing. 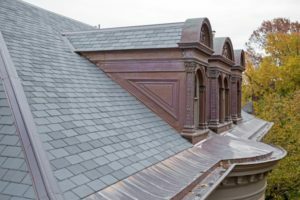 First of all synthetic slate roofing is a lot less expensive than traditional slate, which is one of the most expensive roofing materials on the market. Second, synthetic slate roof is light weight. It is lighter in weight than asphalt. Its lighter weight helps avoid many of the problems that beset traditional slate.It’s easier to transport synthetic slate roofing. Synthetic slate roofing doesn’t require any reinforcements on the roof structure. It’s not fragile, so it can be cut and nailed without damaging the synthetic slate roofing.